What do Startup CTOs Actually do? We Translate. CTO is a pretty glam but mysterious title. I can toss it around to friends and family for some easy “oohs” and “ahhs," but they have no idea what it really means. When I first co-founded AnswerDash as CTO, I didn’t know what it meant either. I browsed around, reading the descriptions of experienced tech entrepreneurs. The person they described seemed like a unicorn: a “kickass developer”, a visionary, a great leader, an excellent people manager, a product customer fit wizard, and business savvy. How could one person possibly be all of these things? Over the past two years, it’s become a bit clearer. While a small startup CTO has to do many different things, most of these are about just one thing: translating ever evolving business needs into ever evolving software. Translating the business picture into an engineering picture. I need to understand where the business is going, what about the business is working, and what about the business is notworking. This is the only way I can effectively prioritize the ever growing backlog of product ideas, customer requests, bugs, and maintenance issues, providing direction and focus to our engineers’ limited time. It’s the only way I can predict what architectures and technology stacks will work for the business in the future. I get the business picture by talking frequently with sales, marketing, and the CEO, negotiating product scope and direction. Translating the market into product opportunities. As CTO, I also help set business direction. It’s my job to know what products exist, how they work, what they’re capable of, what they’re not, and how they differ in reality (and perception) from our product. I do this by playing with a lot of competitors’ products, keeping abreast of the latest academic research relevant to our business, and talking to a lot of other entrepreneurs about the ideas they’re pursuing. Translating product needs into hiring needs. All engineers have technical strengths and weaknesses. Some are stronger on the backend and some on the front end. It’s critical for me to know what aspects of our product are going to require the most iteration and invest most heavily in building a team that supports these needs. And this goes beyond just engineering hires, but is also relevant to engineering managers and VPs of engineering: they need to have the right balance of engineering, product, and management sensitivities for the types of customers, markets, and domains we serve. When I'm not translating, what else do I do? I'm an engineer. This has very little to do with being a CTO. It's only because we're small that we really need my time to build and maintain product. 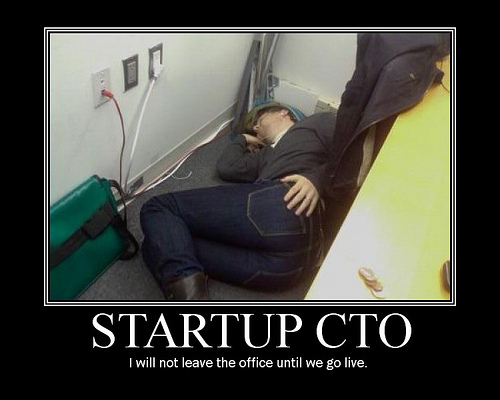 I spend 30-40 hours a week writing code on top of all of the above CTO duties. When we first started, I was the only developer and chief architect, which means I had a huge impact on the technical stack, architecture, and tooling. I'm a VP of engineering, building, managing, and retaining a team of engineers, and managing their priorities, roles, and career development. Again, I don’t view this as part of the essence of being a CTO, but the size of our company means that we can’t waste a slot on a pure manager. I probably spend 10-15 hours a week in this role, making sure our engineers' priorities are in sync with our business priorities. I'm head of IT, providing hardware and software to employees and selecting and maintaining services such as email, calendaring, passwords, and data warehousing. This also has nothing to do with being a CTO, but who else is going to do it on a team of 10? This takes up a few hours a week of my time. I’m a salesman, getting pulled into sales calls and customer success meetings to give customers confidence and impress them with our product magic. Again, this isn't about the core role of translating business into product, but as a C-level exec, this is a key outward facing responsibility. I spend a few hours a week on this. Back when it was just me and my co-founder Jake, I spent half my time on this. I'm an evangelist. Writing this post, tweeting, giving talks... all of these things lend visibility and credibility to AnswerDash and its brand. I probably spend an hour a week on this, but it's a critical long term investment in our market growth. Can anyone really excel at all of these skills? Probably not. I’m good at the translation skills partly because of my Ph.D. (which taught me how to dissect, analyze, formalize and communicate problems, among other things). That took 15 years of deliberate practice. I’m a competent developer and software architect. I’ve been working on that for 20 years. I’m also fine at IT, having spent a lot of time writing code. But the rest of the skills above? I just started on those. But what fun would a startup be if I weren’t learning?